The Assembly Lines Podcast has released a video of one of the many boss battles embedded in the rich Nox Archaist storyline. This content was recorded in the alpha version of Nox Archaist and is expected to be in the final game. Time flies and we want to share with you this Assembly Lines Podcast episode from KansasFest 2018! We dive into the build process and toolchain being used to create Nox Archaist for the first time and discuss their integration with the game engine. Check out the video to see how easily we can switch tile types - grass in the realm is suddenly morphed into cows! Also learn about the upcoming Nox Archaist Kickstarter, likely to launch in early 2019. Earlier this month, some of the 6502 Workshop team attended KansasFest 2018. Besides having a great time, we also had the opportunity to do a public presentation on Nox Archaist, updating the attendees on what new things we've done since last year. If you want to check it out, here's a link to the entire presentation! Stay tuned for further announcements on our upcoming Kickstarter campaign. We can't wait to get Nox Archaist into your hands! Hold on to your coin purse, the Thieves Guild has arrived! We've made a lot of progress on Nox Archaist development this year, and we’ve saved up a couple big reveals for the presentation we'll be doing at KansasFest (July 17 - 22). Stay tuned for more details, including a live stream URL. Thanks for your continued interest and support of Nox Archaist! Thanks For Voting Nox Archaist #1 !! Just recently a month-long poll at ultimacodex.com was held to determine the favorite Ultima-inspired fan project of 2017. The voting has closed, and to our surprise, we ended up in first place! We’re really honored that so many of you voted us as your favorite. But, let’s not forget about all of the other projects going on right now, either. Take a look at this link to see the results, but also to take a look at the (very big!) list of other awesome Ultima-inspired projects that are currently active. Honestly, it feels great to know that we’ve received such a large amount of support from the community, especially considering some of the other fantastic projects out there. That said, we did come out on top: We are Number One! Wait, that’s the wrong sort of Number One. Ah well, close enough. Help Nox Archaist make it to #1! The awesome Ultima news site “Ultima Codex” is hosting a poll for the "Favorite Ultima Inspired Project" of 2017. Nox Archaist is currently ranked #2 thanks to the strong turnout from our fans. Thank you! However… not to be greedy or anything, but… we want to be Number One! No, that doesn’t mean we have an excessive fascination with Commander William Riker, and we don’t want to step over the backs of chairs. But it does mean that we’re just a few votes from being the #1 most anticipated Ultima-inspired project of all of 2017! If you haven't voted yet, or are inclined to vote twice (just kidding, plus you can’t, we tried), please click here and cast your vote today! Our first update for 2018 is here, and it's a great one! We continue to make great progress with coding Nox Archaist and we're excited to share the news with you. While there are many new developments to share, some stuff remains the same: Our top priorities continue to be creating an awesome sword and sorcery tile-based RPG, make it available in a boxed edition just like you would have purchased in the 80s or early 90s, and get you guys cool feelies like a cloth map and printed manual full of professional artwork. The image below gives you an idea of the coolness you can expect in the boxed collector's edition. Right now our dev team of Mark Lemmert, Mike Reimer, Bill Giggie, Robert Padovan, Electric Moo, Peter Ferrie and Michael Pohoreski are focused on coding, gameplay, storyline, and graphics development. Below is a sample of the the awesome artwork that Bill has been crafting lately! The various scenery and backdrops for the "Make Camp" activity in Nox Archaist will change based on the player's location. We expect at least 3 variations and are shooting for more. It's the little details like this that are going to really make Nox Archaist stand out! Meanwhile, our Community Management Team (that's right, we actually have one now) of Chris Torrence and Jarrod Kailef are working diligently to produce an awesome new gameplay trailer that will capture the essence of the Nox Archaist world even better than our prior videos. With custom music, voice acting, and expert video editing, we expect this new video will really reflect the excitement we all feel about this game. 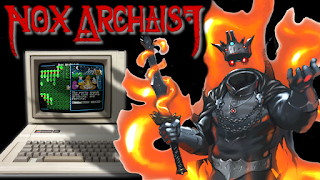 We want this video to show everyone just how top notch Nox Archaist is going to be! In addition, Chris and Jarrod are also working on our Kickstarter Reboot, which is expected to launch sometime this year, most likely by spring. We've received a number of requests for a playable demo, and agree that would be awesome. A Nox Archaist demo is possible, as long as it doesn't delay the release of the full game. Our plan is to develop a playable demo that evolves more-or-less naturally from our world building activities. In short, if we can work a demo into the production schedule without a significant delay, we'll do it, but we're not entirely certain if that will be feasible just yet. Stay tuned for more news on this! Another event on the horizon is of course KansasFest 2018. Since Kfest Committee Member Andy Molloy didn't remove us from the podium with a hooked cane last year we trust there might be at least some interest in Nox Archaist "The Session" Part Deux. We plan on exploring this possibility later in the year. Stay tuned for more updates, new videos, new screenshots, and inside information into the development of Nox Archaist! Nox Archaist is the 2017 Ultima Inspired Project of the Year! Receive Nox Archaist Email Updates! 6502 Workshop, LLC, 2017. Press Kit. Simple theme. Powered by Blogger.